By Scott Gilfoid: Promoter Frank Warren is saying that IBF super middleweight champion Carl Froch (29-2, 21 KO’s) turned down a a mouthwatering offer of £1million to fight Warren’s guy unbeaten WBO light heavyweight champion Nathan Cleverly (24-0, 11 KO’s) in a catchweight. Froch, however, reportedly turned down the fight and instead is fighting Yusaf Mack on November 17th in Nottingham. So let me get this straight. Froch turns down £1million for a fight against Cleverly in order to fight Yusaf Mack? I don’t see how Froch can get that kind of cash to fight someone like Mack. Why would Froch turn down that kind of cash when he wasn’t even going to have to move up to the full weight for the light heavyweight division. Warren said it himself that it was going to be a catchweight fight, so it isn’t as if Froch was going to have to put on a ton of weight to face the 25-year-old Cleverly. That’s really disappointing, isn’t it? 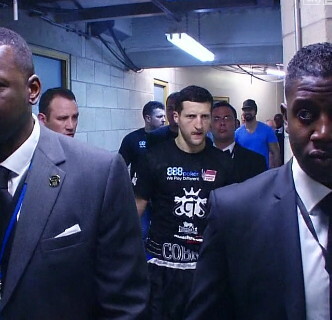 Froch turns down £1million in a Cleverly fight in order to face Mack for who knows how much? Why would Froch turn down that kind of cash? Let’s just ignore the cash for a second and focus on the attention Froch would have received had he taken the Cleverly fight. A fight between Froch and Cleverly would be huge in the UK. Even fans in the U.S and other parts of the world would be interested in that one. So why turn down all that money and the huge attention that fight would have generated? Oh, this is sad. I never thought I’d see Froch turning down that kind of green stuff just to face a guy that few boxing fans want to see him fight. With Froch showing no interest in facing Cleverly, Warren has no scheduled Cleverly to defend his World Boxing Organization 175 pound title against #9 WBO Vyacheslav Uzelkov	(27-2, 16 KO’s) on October 27th at the Motorpoint Arena, Cardiff, Wales, UK. Warren tried to get Beibut Shumenov, Mikkel Kessler and Bernard Hopkins for Cleverly but had no luck. « Has Froch let his fans down by picking Yusaf Mack to fight next?